AFC - 10/16/10 What is Wrong with McDonald's? 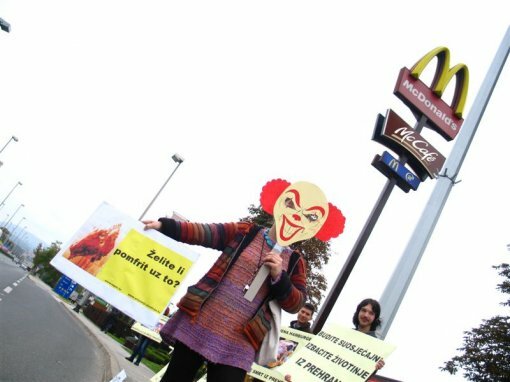 This company, which around the world "feeds" the population of Spain, has been accused of crimes against animals, huge damages to ecology, exploitation of children and workers, manipulating children, serving unhealthy food, and sustaining global starvation. 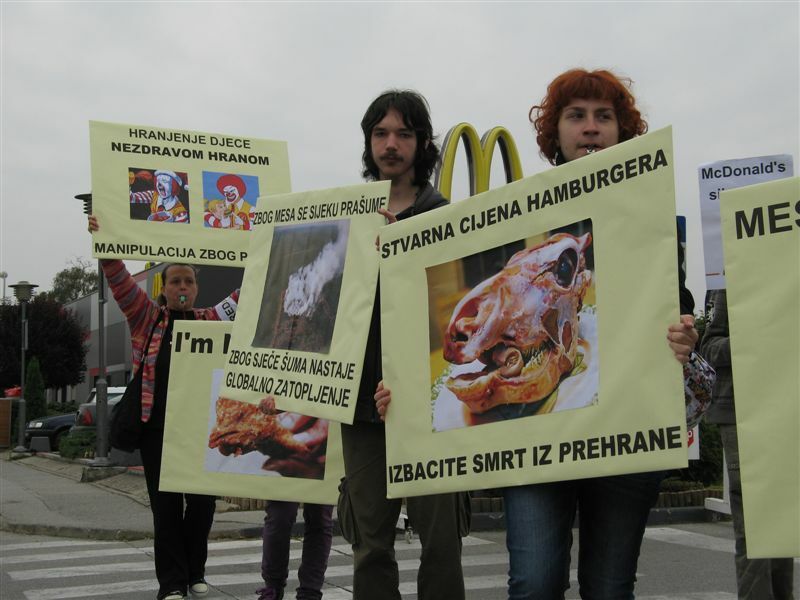 McDonald's is responsible for the death if millions of animals each year, their poor treatment and brutal slaughtering. 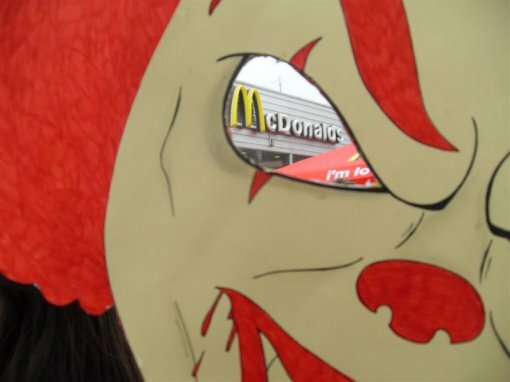 There is a direct link between McDonald's and the destruction of the rainforest, cleared in order to make room for pastures. Deforestation leads to the extinction of numerous plant and animal species, driving away indigenous populations, and contributes to global warming. 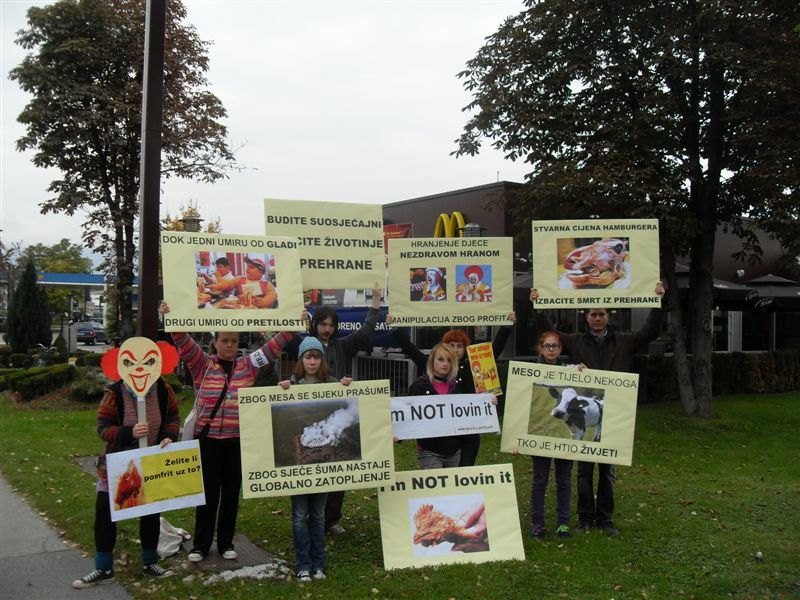 Out of these reasons, Animal Friends will join activists all over the world on October 16, the World Anti-McDonald's Day, by organizing actions in front of five restaurants in Zagreb. With banners, fliers and a megaphone, activists will appeal to citizens to reconsider what is wrong about McDonald's. 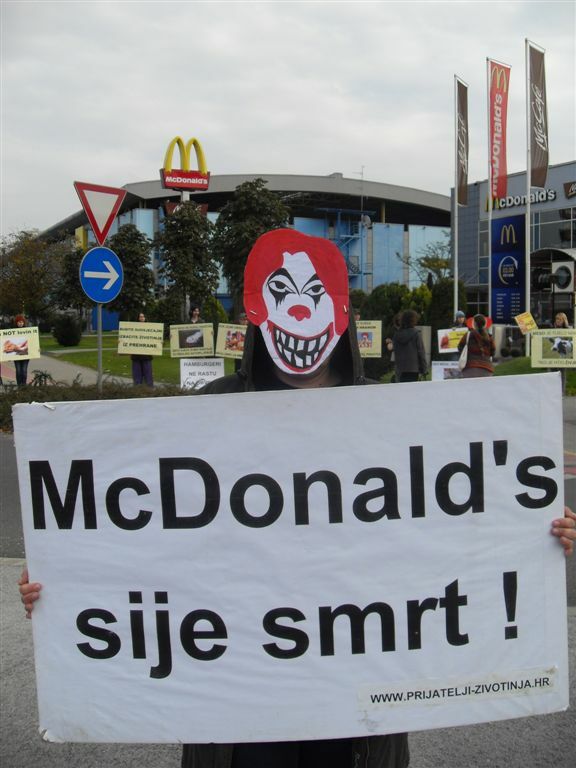 The events will take place from 11 A.M. to 11:30 A.M. in Dubrava, from 12 noon to 12:30 P.M. on Kvaternik Square, from 1 P.M. to 1:30 P.M. in Heinzelova ulica, from 2 P.M. to 2:30 P.M. in the underground passage of the Zagreb Central Station and from 3 P.M. to 3:30 P.M. in Vrbani. The complaints about manipulating children present a serious problem to the company. 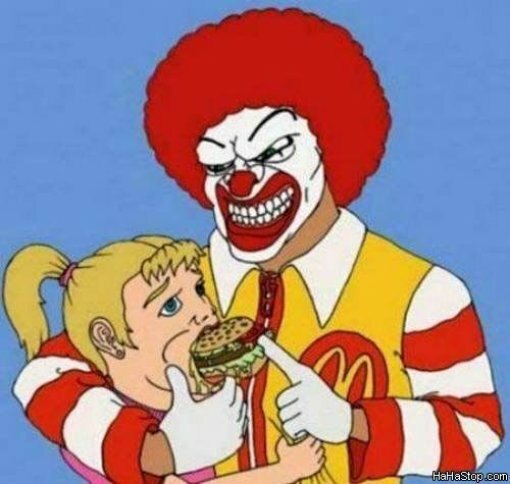 Numerous toys and commercials designed especially for children draw them to the restaurants as if they were hypnotized, creating a "vicious circle" for both parents and children, who grow up to become life-long visitors of McDonald's. There is justified suspicion that their toys are being produced by child labor in Third World countries. 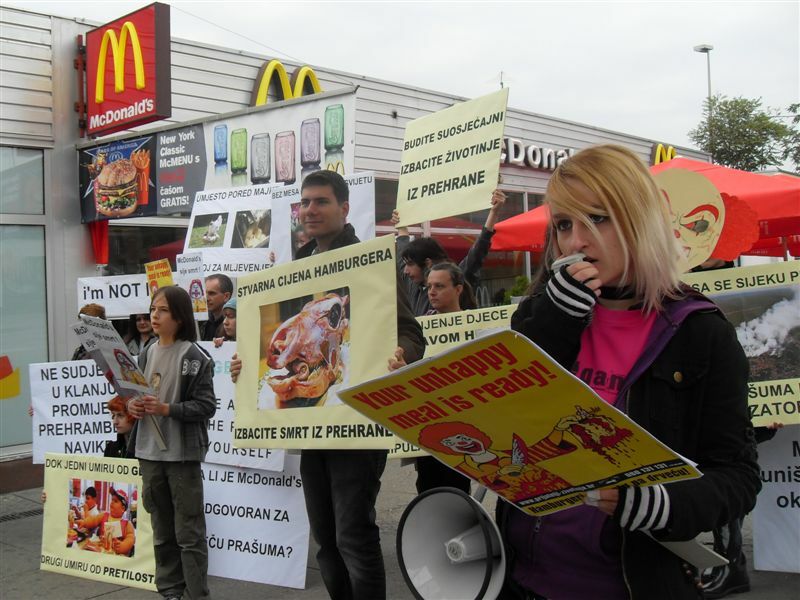 Each year over 50 billion animals are raised on farms for the trade with their meat. Sensible beings are being captivated and submitted to everyday suffering in order to be brutally slaughtered for hamburgers and other meat products. 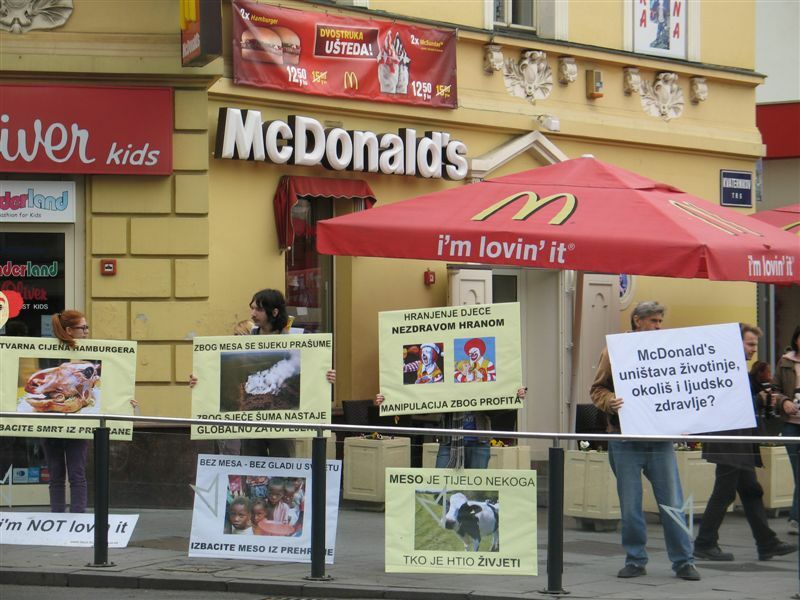 Ground animals full of antibiotics and pesticides packaged in colorful packages are offered as food. In doing so, the fact that people can live without meat and live off plants proving them to be vital, less sick and live longer is being obscured. It is not a coincidence that the World Anti-McDonald's Day is marked on the World Day of Food. All animals bred for food eat more protein than they produce – at least 9 kg vegetal protein in order to produce 1 kg of meat. In the West, 80% of all cereals are used to feed animals. Besides, Western countries use their power in order to force poorer countries to produce food for animals instead of producing food for their own people. By adopting a meatless nutrition, each one of us can sustain rational exploitation of natural resources. Animal Friends appeal to the people to boycott McDonald's restaurants thus protect themselves and their children and consider a healthy plant-based diet for which animals are not being killed, and which does not affect world hunger nor damage the environment.